Marine lenders say August powerboat sales offset weak July sales with strong dollar growth and unit growth. Recreational boating weathered a rough July as sales fell across most major industry categories. 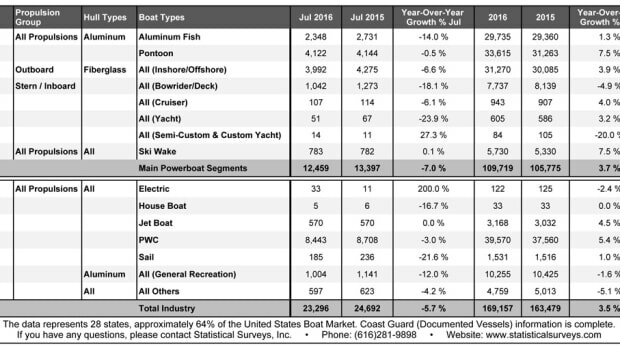 Powerboat sales were likely “flattish” year over year in July, a Wells Fargo marine industry analyst says. Retail sales in the main powerboat segments likely increased between 6 and 8 percent in June. Resilient U.S. consumers, favorable spring weather and strong March boat sales trends point to a very solid marine industry in its peak selling season. Marine wholesale and retail lending trends are strong with the selling season starting earlier than in the previous two years.